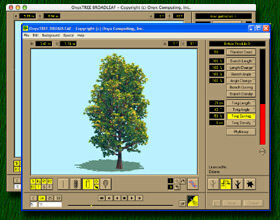 Files with bro suffix might be 3d models of tree, shrubs or other vegetation made using the Tree Professional Broadleaf Creator by Onyx Computing. File extension bro is mainly related to a special 3D Tree format used in ONYX Tree Professional Broadleaf, a dedicated procedural creator and modeler of 3D broadleaf trees, shrubs, and bushes. A .bro file represents a complete 3D model of a tree, shrub or brush. OnyxTREE BROADLEAF is a dedicated procedural creator and modeler of 3D broadleaf trees and bushes. Besides 3D it exports lit single polygon panel trees with shadow. You can open and edit this type of .bro files only using Onyx Tree professional. Some sort of export to 3D exchange formats is perhaps possible with the Onyx Tree software. Click on the software link for more information about OnyxTREE BROADLEAF. OnyxTREE BROADLEAF uses bro file type for its internal purposes and/or also by different way than common edit or open file actions (eg. to install/execute/support an application itself, to store application or user data, configure program etc. ).